Read each Citizen's unique story. 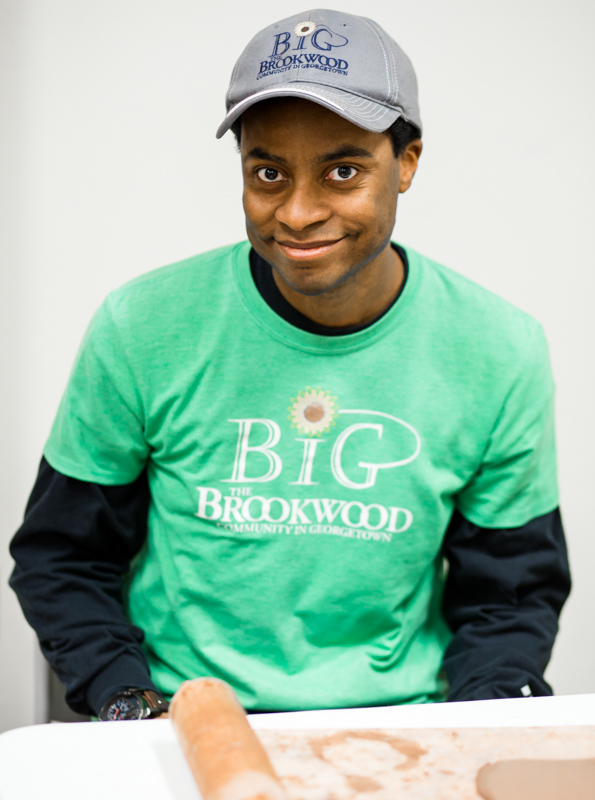 Ambrose’s rhythmic positivity and strong work ethic help’s keep a lively tempo at BiG. He loves to rock out to Coldplay, Gospel and Disney music while he works and is eager to help with any job. When not working at BiG, Ambrose enjoys relaxing at the beach, bowling, going to the movies and worshipping at church. 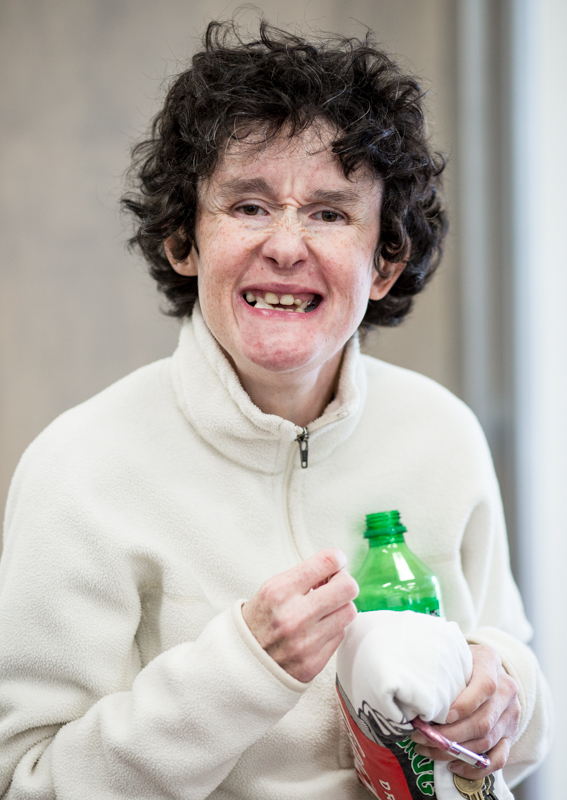 Although originally from Irving, Amy has been a Georgetown resident for as long as she can remember. 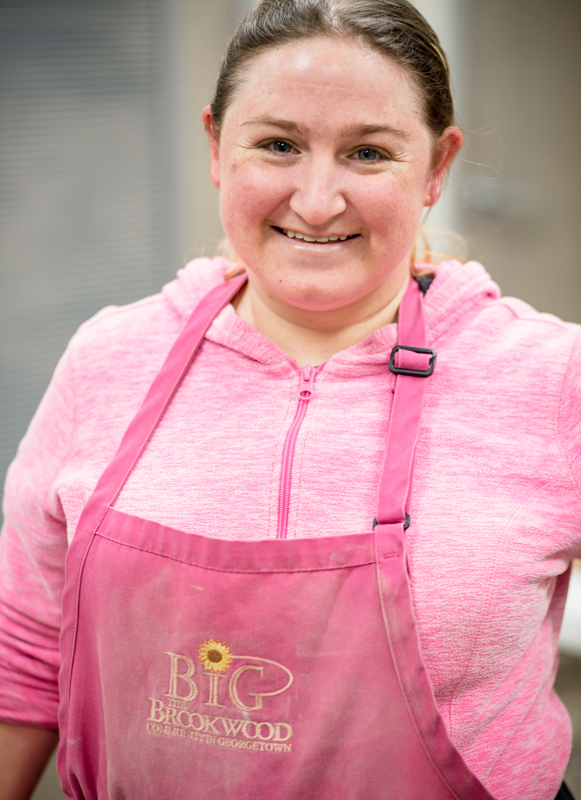 She loves working in both the BiG café and shop, but her favorite part of BiG is working with the clay alongside her friends. At home, Amy spends her time watching Texas Rangers baseball and Longhorn football with her dad. She would like everyone to know how happy she is working at BiG. 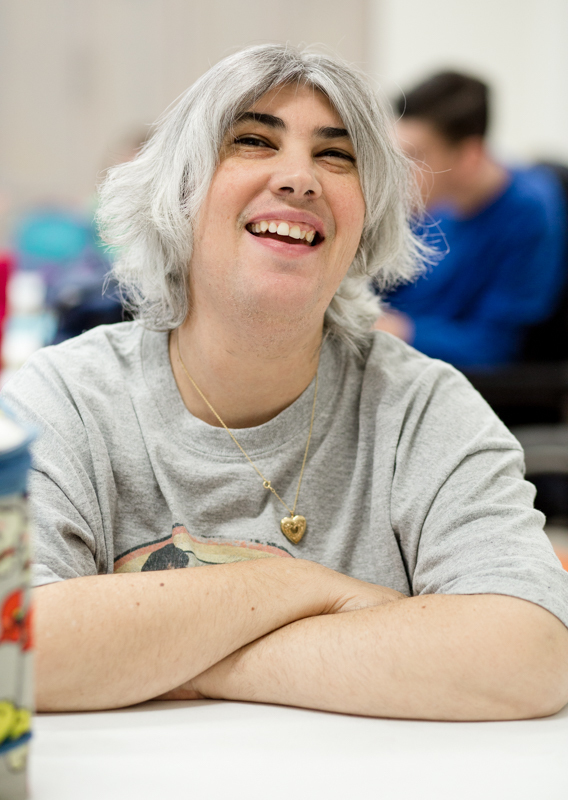 A sweet and caring soul, Andrea’s kind and comedic spirit infects everyone she meets. A Citizen since April, 2016, Andrea truly enjoys every enterprise. Her favorite part of BiG, however, is our daily prayer and devotional. When not at BiG, Andrea enjoys exploring new places, listening to Christian music and reading. Andrew was born in Clearwater, Florida but is now a full blown Texan. His love of country music and larger than life smile has been a welcome presence at BiG since June 2016. The BiG Band is this music lovers favorite part of BiG with glazing as a close second. 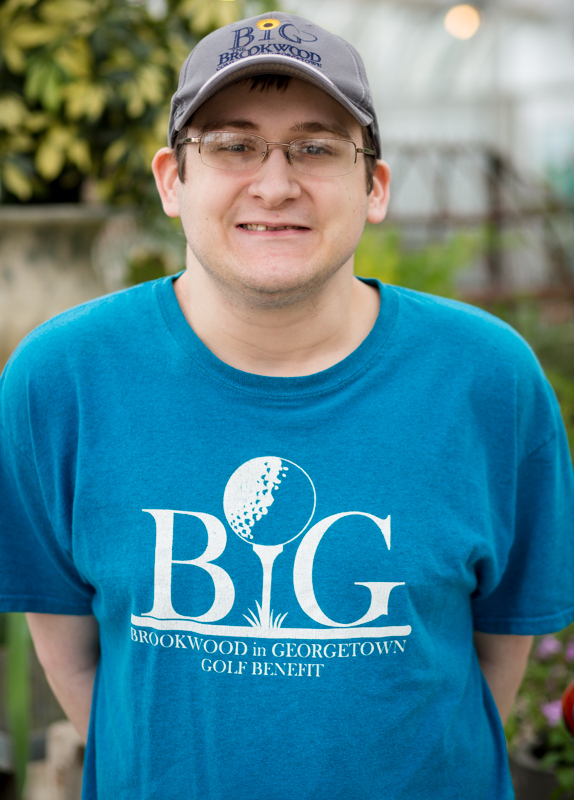 When not at BiG, Andrew loves going to the pool and watching TV- Jeopardy and Wheel of Fortune are two of his favorites. Anthony loves to read, holds a vast knowledge of all things Titanic, and is a skilled model builder. He is both a practical joker and a sensitive soul, and keeps his peers and staff laughing at BiG. Outside of work Anthony relaxes by hanging out outside or watching Batman movies. He loves animals and has two dogs and two cats. Ashley loves all things fun – and it shows. Some of her favorite things include costumes, dancing and singing. 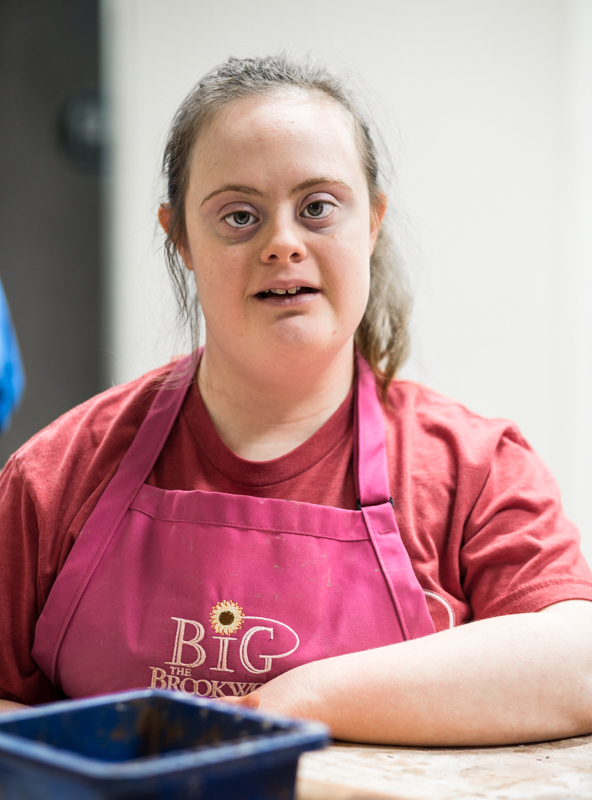 At BiG, Ashley enjoys hand making cards and working in the BiG Café but its her new friends that she loves best. When she is not at BiG, Ashley enjoys spending time at her grandparent’s ranch. Ashley would like everyone to know that she is a Disney expert and aspires to one day star in her own dance show. Ashley was born on the island of Galveston, moved to Round Rock when she was young and soon developed an intense passion for the UT Longhorns. She has a vibrant sense of humor and a sweet spirit, and often makes her famous “Turtle Face” to cheer us up. 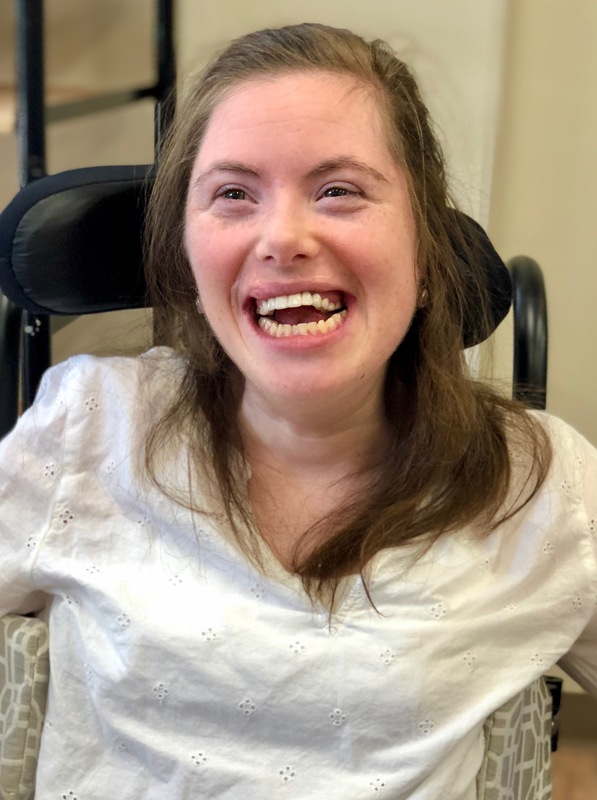 Ashley loves going to Lady Longhorn basketball games, sitting in a deer blind with her Father, watching movies, and hanging out with her sisters. Auggie’s winning smile and can-do attitude make him a welcome addition to the BiG workplace. This hard worker from Pflugerville is an Eagle Scout and an accomplished Special Olympics athlete. Auggie enjoys horseback riding, and watching videos on the computer. 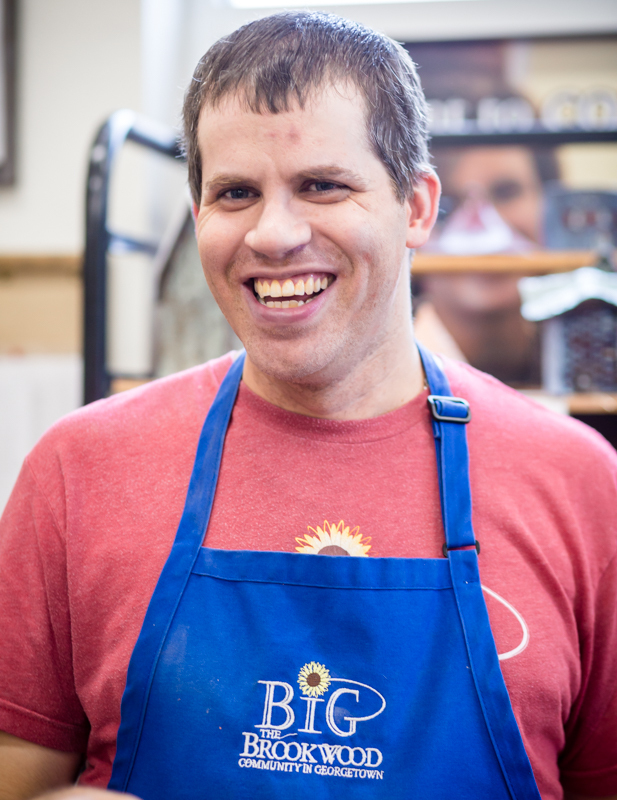 He enjoys making beautiful items working alongside his friends at BiG. Bart was born in Austin, and moved to Georgetown in 2003. From pounding out large slabs of clay to finishing detail work on a card, Bart brings a myriad of skills to BiG. He is a kind soul always looking to lend a hand to anyone who needs it. On the weekends you can find Bart working at a local theater, skateboarding, or playing video games. One day he hopes to travel the world. Born in India but raised in Michigan, Beth moved to Georgetown in 2009. Beth is not only a skilled glazer but also a kind and thoughtful friend. 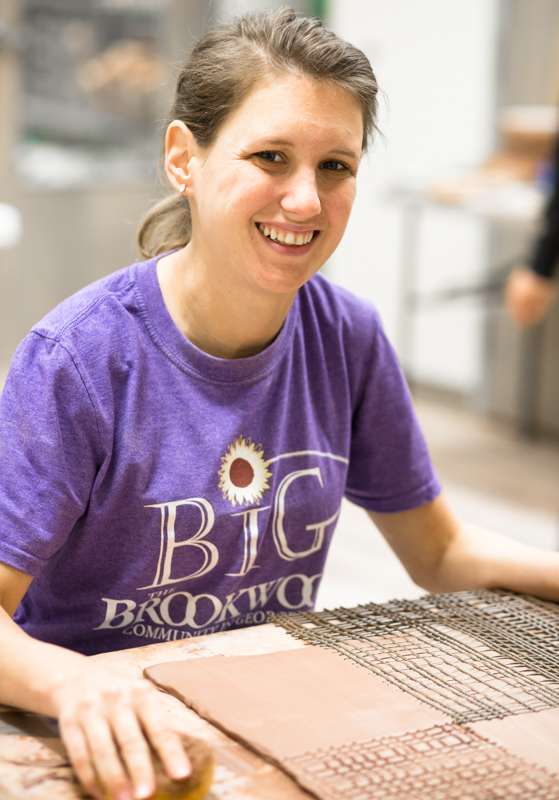 Here at BiG, she enjoys glazing and working in the BiG shop. Beth spends her weekends on ice, either figure skating or playing hockey. She also loves to write, especially for her family blog. Beth would like everyone to know how much she loves being a part of the BiG family! Bob is a dapper young man who loves to come to work. He has a quiet spirit and his sense of humor is out of this world. He loves working in all of our enterprises but it is joking around with his friends that he loves the most. Friends and Family are his two favorite things. When not at BiG he loves to swim, bowl and play catch with his brother. Bradley is a very friendly guy who makes everyone feel welcome as soon as they come in the door. When he is not at BiG, Bradley loves riding his 4-wheeler, watching NASCAR, listening to George Strait, and working outside with his Dad. On the weekends he works at a local movie theater and hopes to one day attend a Jeff Gordon NASCAR race in Las Vegas. The oldest of five, Brian and his entire family moved from Ohio just to be a part of BiG. He is polite, hardworking and an asset to the organization. Brian welcomes every newcomer with a sincere greeting and his infectious laugh is enjoyed by all. He loves a wide array of music that spans from Luke Bryan to Carly Simon and can sing along to every tune. Brian’s favorite enterprise is clay but his favorite part of BiG is all of the friends he has made. 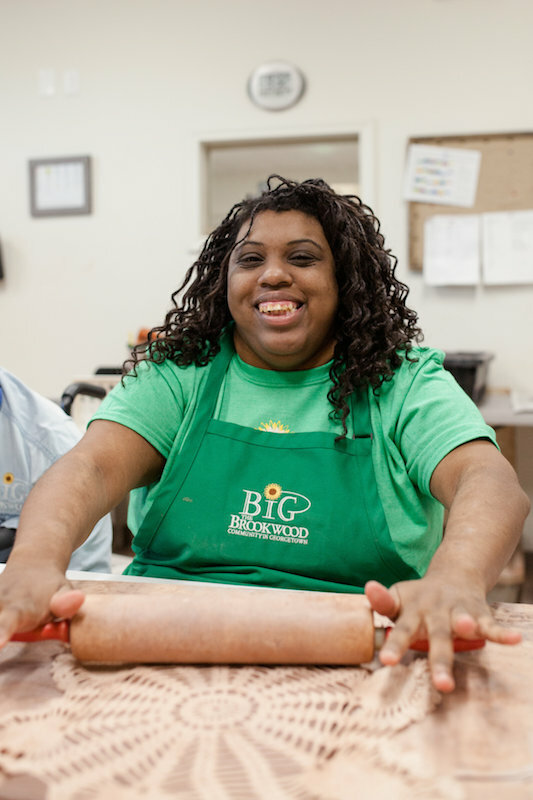 Briana has a smile that can light up any room, and she does so on a daily basis at BiG. She is a skilled potter and wonderful glazer but it is delivering cookies to Hat Creek that is her absolute favorite. 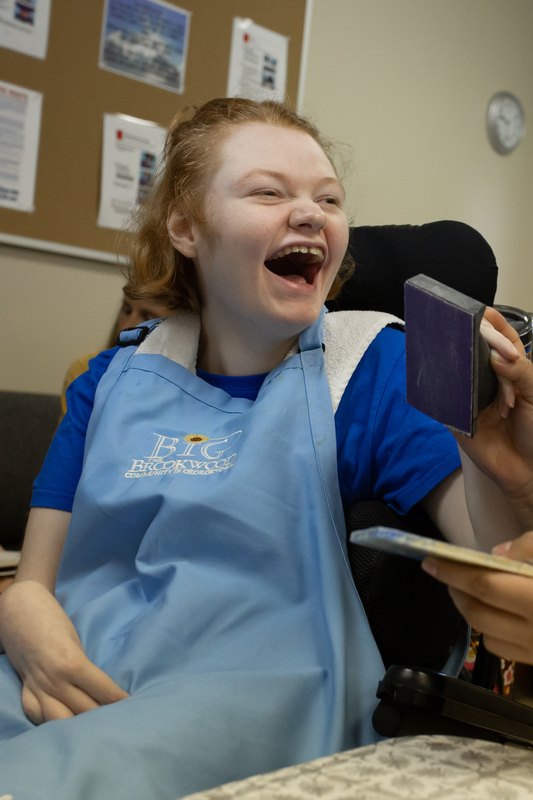 While not working, Briana loves to do puzzles and play games on her ipad. She would like everyone to know how much she loves her friends at BiG. Brittany is a constant light each day at BiG. From day one, she was part of the family making fast friends with staff and Citizen alike. Her wonderful personality and love for joking around keeps us constantly laughing. 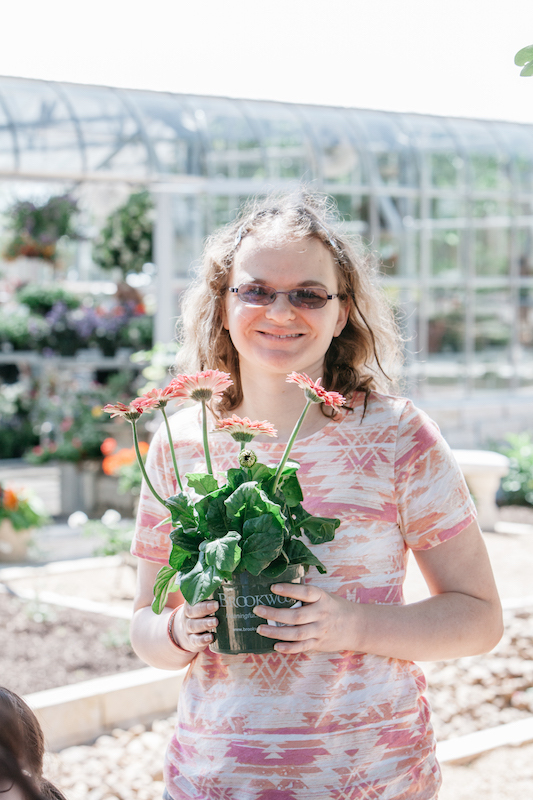 In her free time, Brittany enjoys competing in one of her many Special Olympic endeavors as well as spending time with her family, usually cheering on the Cowboys. She would like everyone to know that decorating her yard at Christmas is one of her favorite things to do. She even has a 12’ blow up dragon with candy canes!! There is never a dull moment when Caitlyn is around. Her fun and outgoing personality lights up our workroom. While Caitlyn loves almost all musicals, the Phantom of the Opera is her absolute favorite. 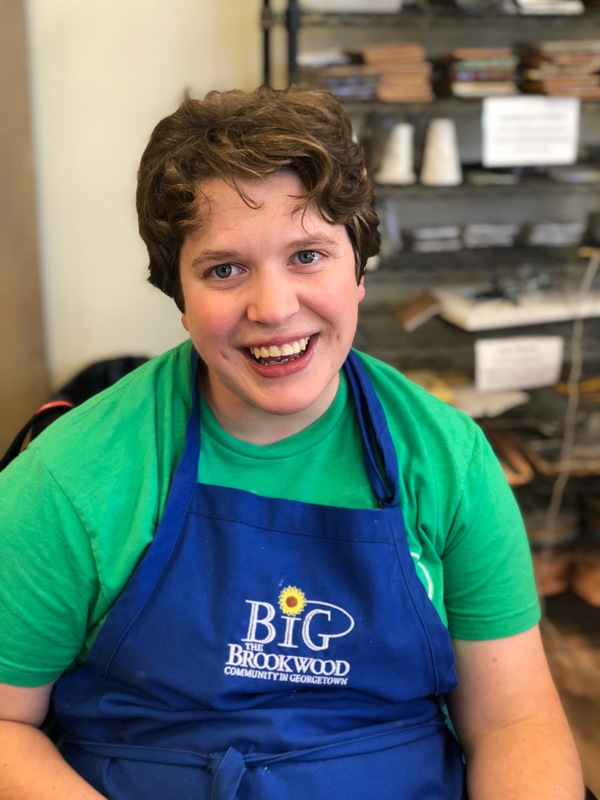 At BiG, Caitlyn loves working with clay as well as in the Cafe but it is her friends that make BiG one of her favorite places to be. 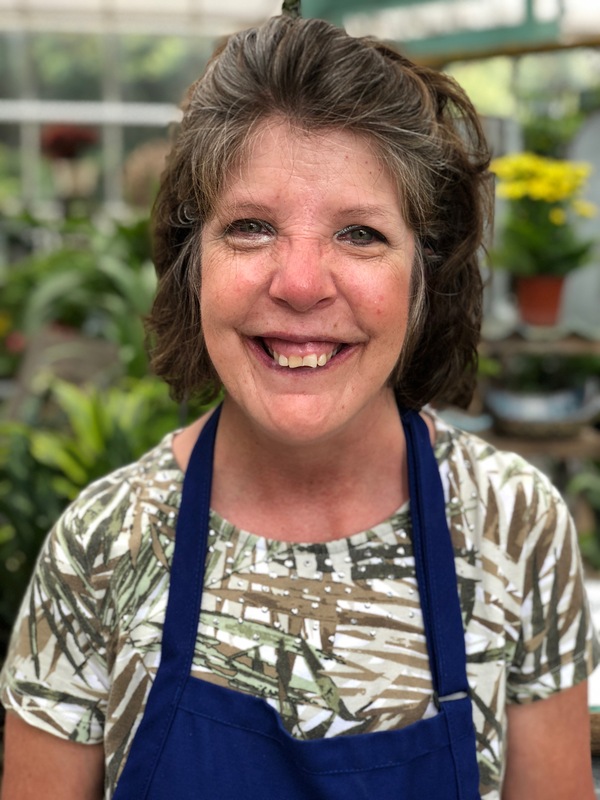 Originally from St. Louis, Carol moved to Georgetown in 2017. She is a sweet and quiet spirit with a huge heart for her friends at BiG. While Carol enjoys all enterprises, she likes working in the café and making cards and banners the most. When not at work, Carol enjoys spending time dancing, walking her dog, and bowling. She would like everyone to know how hard she works and how much she loves her job! Always the first to arrive at BiG, CB is kind, helpful and an all-around cool guy. He loves to greet his coworkers by helping them find their apron each morning. 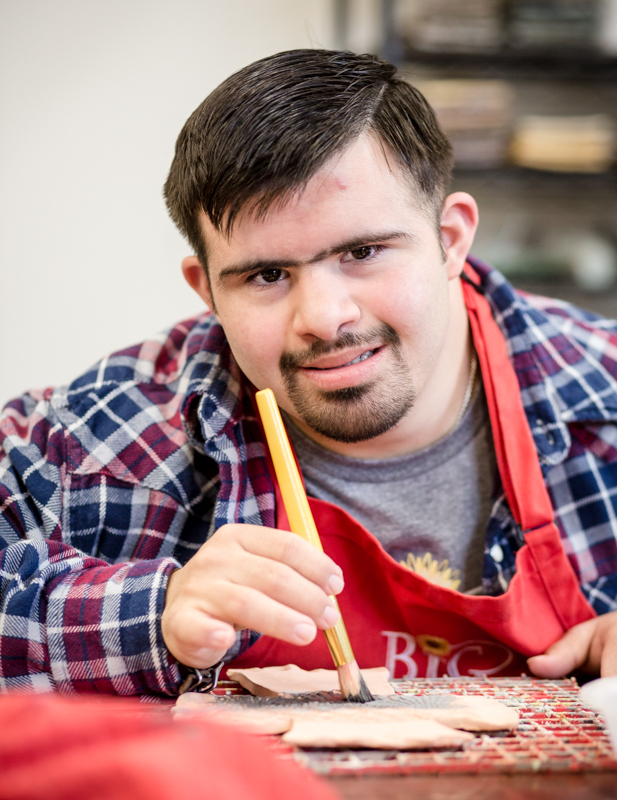 His favorite part about BiG is working with his friends and making beautiful pieces in the clay room. In his free time, CB loves participating in Special Olympics. He enjoys playing basketball, bowling and hanging out with his family. We are so thankful to have him as a part of our BiG family. Originally from Kansas, Chelsea and her family moved to Georgetown in 2007. 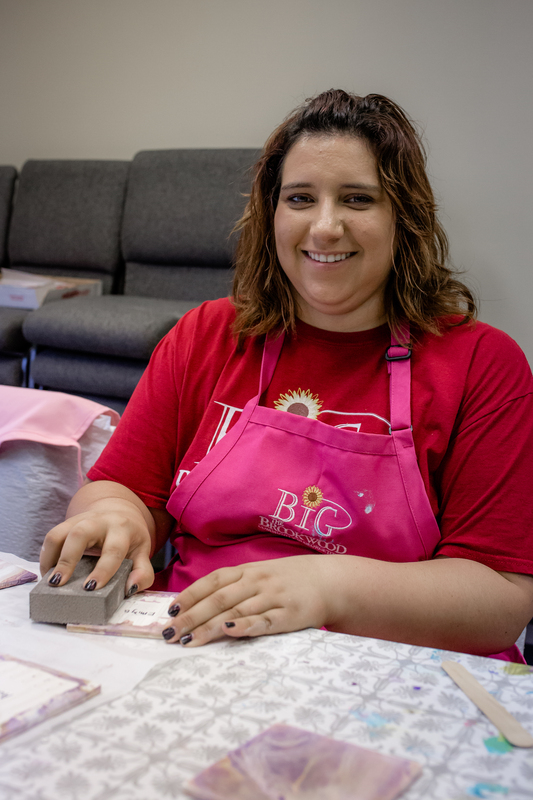 At BiG, Chelsea loves creating pottery and handmade cards. She is quick to share the books she brings to the program with staff and volunteers. Chelsea has a deep love for animals and goes to cat and dog shows during her free time. Her favorite breed of cat is the Tonkinese. Traveler, horseback rider and musician are just a few of the many hats that Chrissy wears. When not at BiG, she loves being outside and listening to music. Her excellent card skills have been a welcome addition to our BiG team. However, working in any enterprise surrounded by her friends is her favorite part of working at BiG. 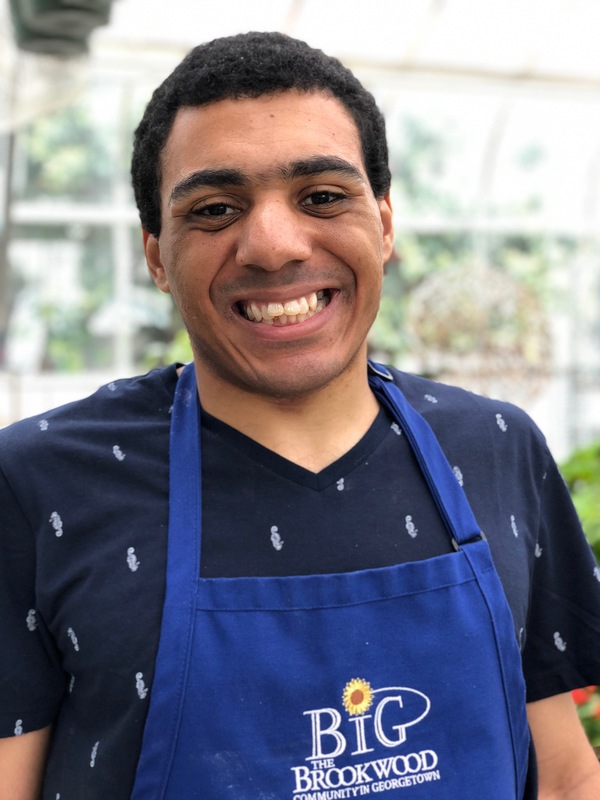 Christopher enters each work day with a smile and positive attitude. No matter the enterprise (although greenhouse and cards are his favorite), he is always ready for any task. Christopher is also always ready to share his impressive CD collection and provide a one-of-a-kind soundtrack in the work rooms. 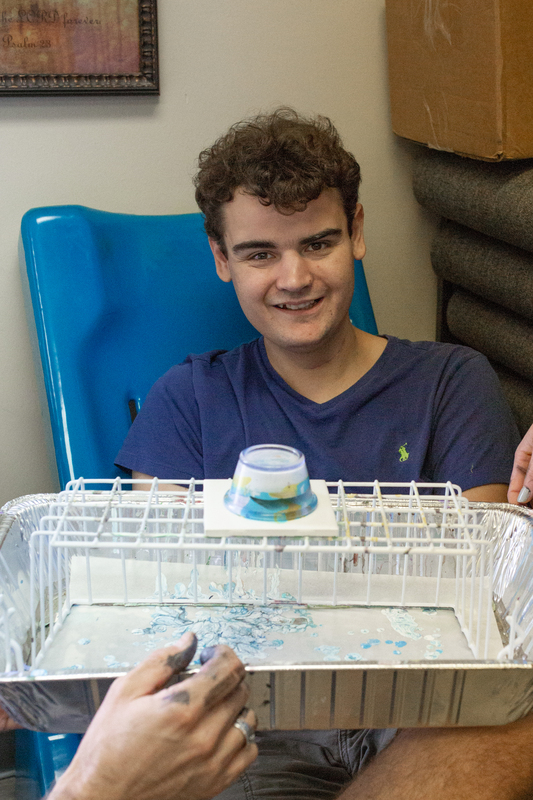 At BiG, Connor loves glazing pottery and seeing the transformation after it is fired in the kiln. He also enjoys making people laugh by telling clever jokes, many of which he makes up himself. When not at BiG, Connor loves traveling with his family, going to the movies, being on the computer learning facts about history and astronomy. He is a proud uncle to Colton and Morgan. 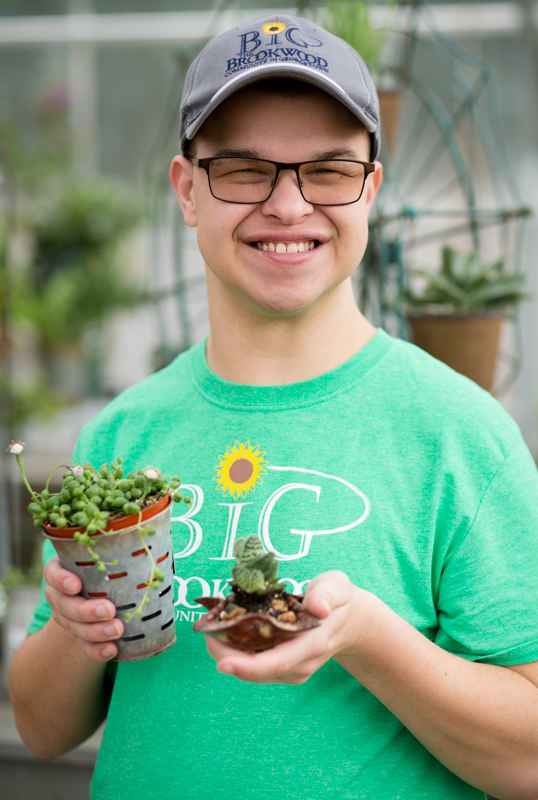 Born in Austin, Texas, Corey began attending BiG in the spring of 2015. As our resident history buff, Corey can provide facts ranging from Ancient Mesopotamia to the Great World Wars. 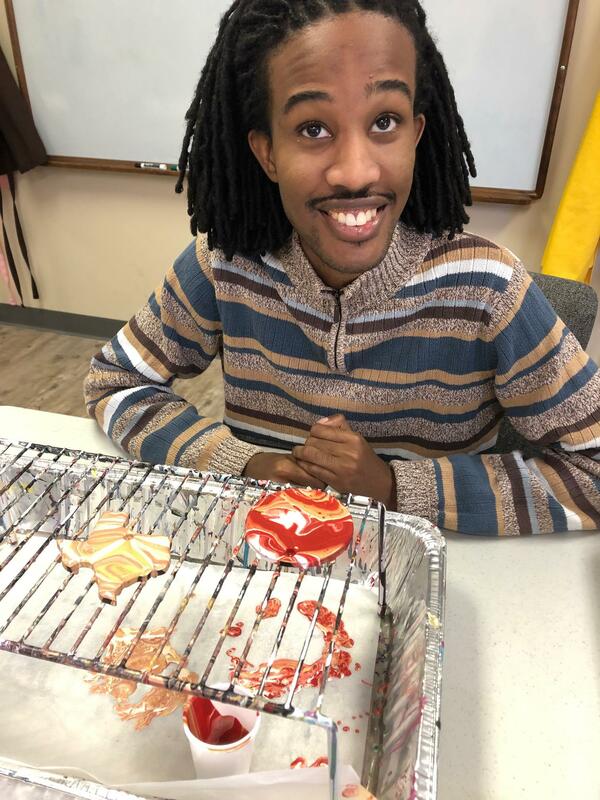 By creating beautifully detailed glazed pottery, pounding out slabs of fresh clay, and delighting his peers with his Goofy impersonation, Corey brings a multitude of talents to BiG. In his free time he loves to play video games, browse the internet or go horseback riding. Born in Louisiana, raised in Oklahoma and now a full-fledged Texan, Darla is a refreshing addition to this BiG family. She is a hard worker who always exudes a positive attitude. 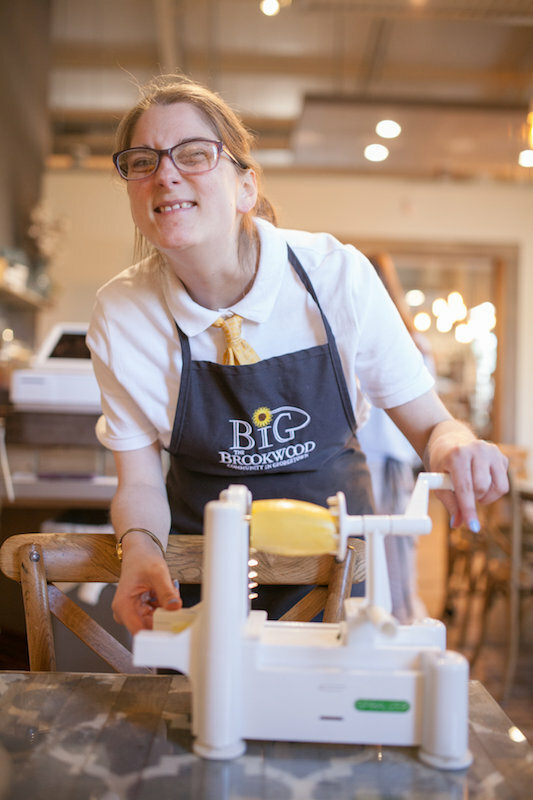 At BiG Darla excels in all enterprises but it is working with customers in our retail shop and café that excites her the most! When not at work, Darla loves feeding deer in her backyard and playing board games. Darla is always able to bring a smile to your face and wants everyone to know how much she loves her job! Debbie is an enthusiastic worker with an admirable ability to accessorize. She loves to motivate and help her coworkers. Debbie often brings in drawings and notes of encouragement for volunteers, staff and friends. 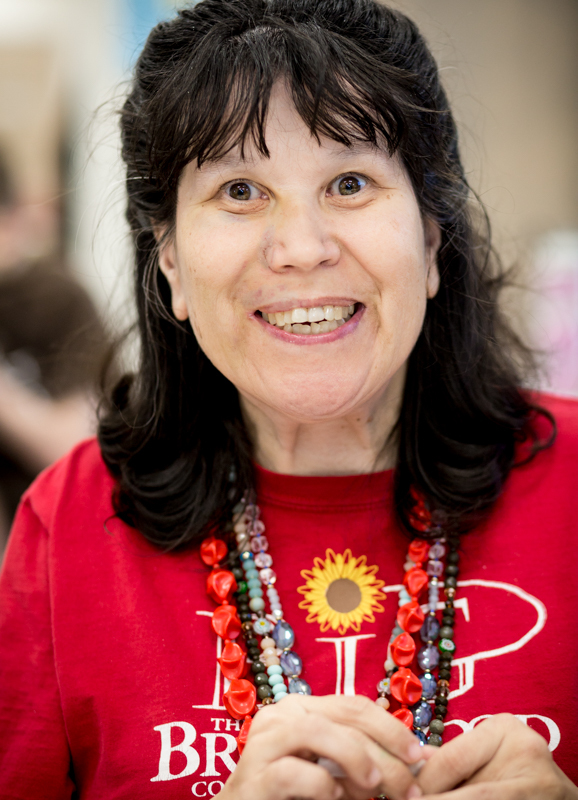 In addition to writing and art, Debbie enjoys completing puzzles, making jewelry, helping with chores, listening to music and watching movies. Born in Arlington, Texas, Emma moved to Hutto and began attending BiG in 2014. She can light up a room with her vibrant smile and loves all things musical, especially Disney themed. On Tuesdays, Emma can be found dancing during BiG’s weekly live music session. When not at BiG Emma enjoys watching movies, doing Zumba, and going out to eat. Emma is a joy to be around. She is kind, funny, and outgoing. 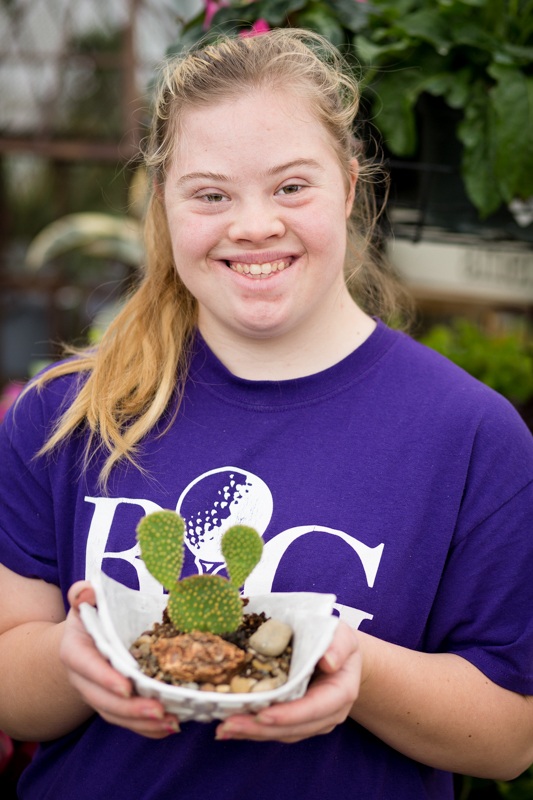 She loves working in the café, the greenhouse, and clay the best, but is mostly just happy to be working at BiG. When not working, Emma can be found walking her dog or hanging out with her sisters. She loves participating in Special Olympics and tries to be involved in every sport possible! She would like everyone to know that she is brave and cheerful! 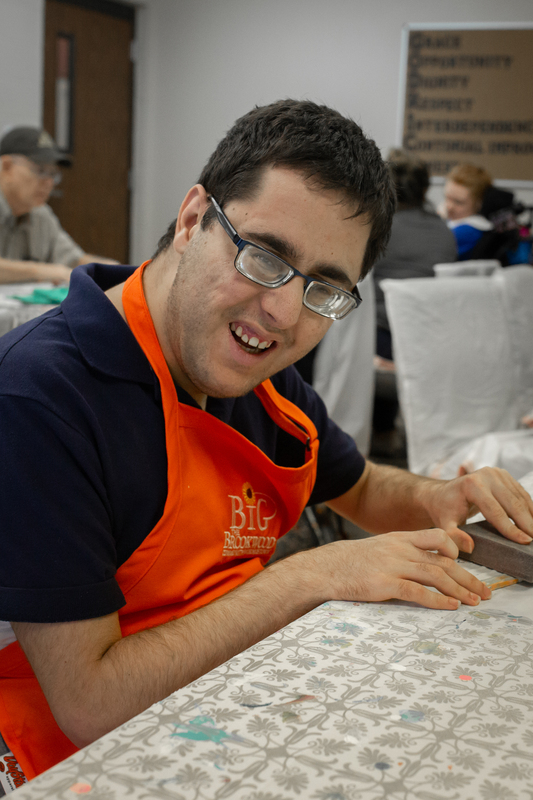 Eric brings laughter, singing and dancing to our work- rooms. He is a skilled potter and masterful glazer. 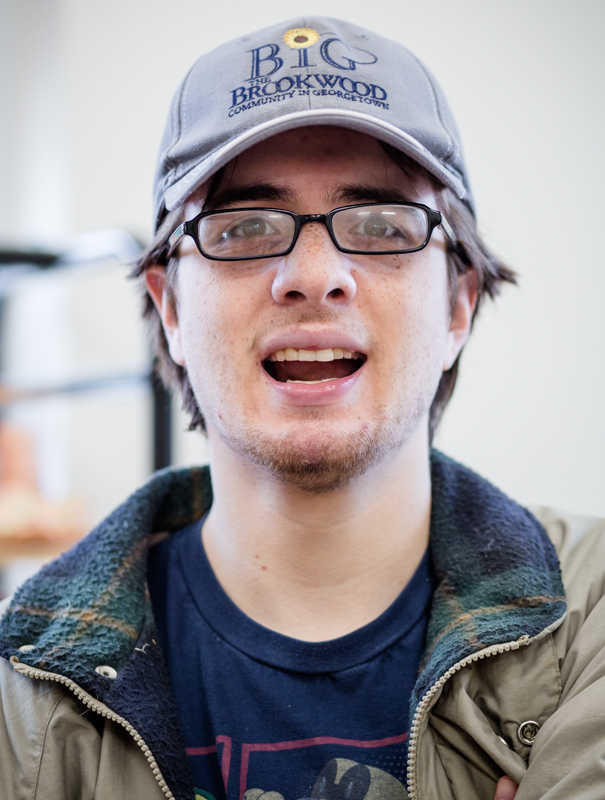 Eric’s acting skills and humor made him the perfect “Tinman” in our Wizard of BiG production. 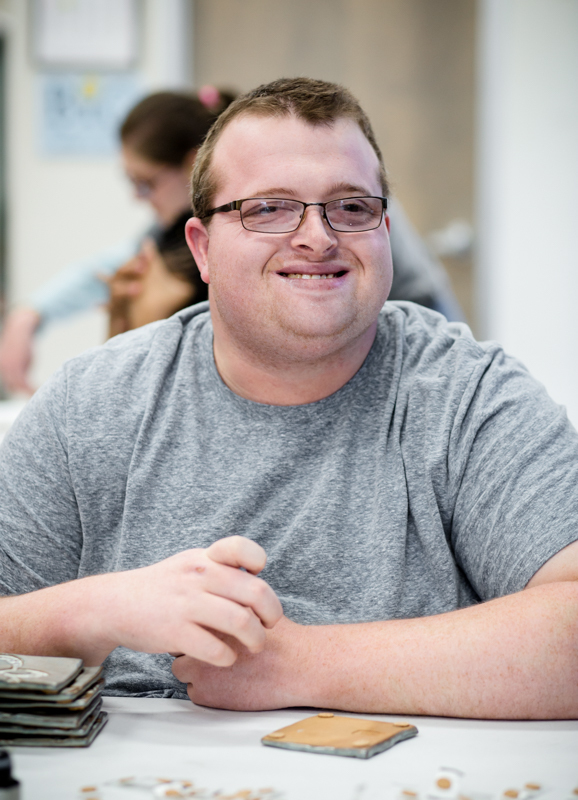 Eric enjoys bike riding, playing video games, working at Kohl’s, and hanging out. He has won several gold medals in Special Olympics bowling, standing long jump, and the 100-yard dash. Originally from California, GiGi relocated to Georgetown to become part of the BiG family. She brings many wonderful attributes to work such as her constant joy and larger than life personality. Although some of her favorite things to do are to chat and play games with her friends and coworkers, she is always ready to give it 100% in each enterprise room. 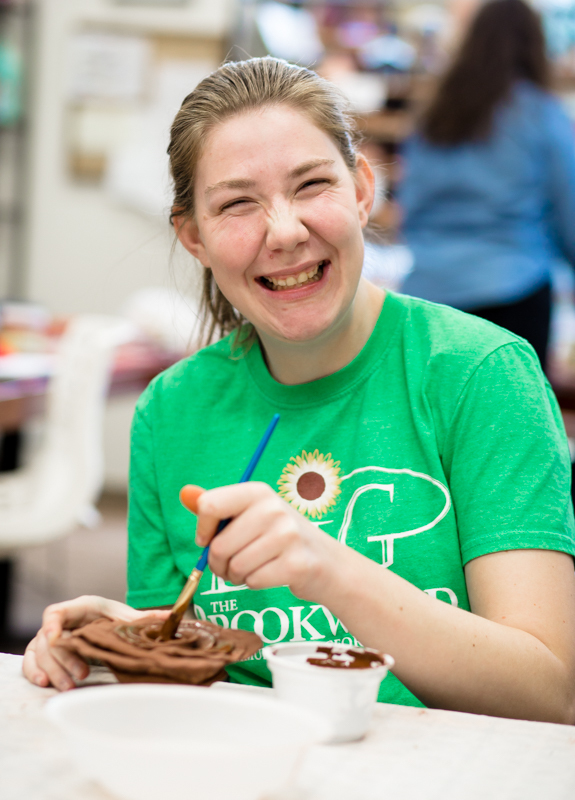 Gracie filled our work rooms on a daily basis with her vibrant personality, infectious smile, and joyous laugh. She loved chopping strawberries in the café, pulling up the lace in the clay room, and dancing with her coworkers to Taylor Swift. From skiing in Colorado to traipsing around New York City, Gracie delighted in adventure. 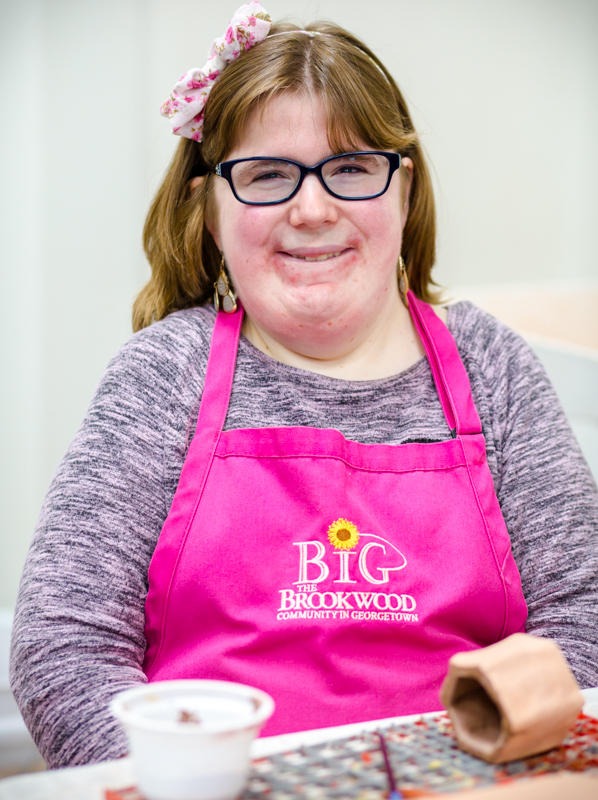 Gracie was the inspiration for BiG, and because of her, an ever-growing number of adults with special needs have found meaningful work, a sense of belonging, and real community. Gracie went home to dance with Jesus on September 8, 2018, and although we miss her every day, we know the Lord will use her legacy to touch countless lives in the years to come. Besides being a proud older brother to twin sisters, Jackson enjoys spending time in Durango, Colorado with his family where he skis and plays golf. He also likes to catch a wave when at the beach. Jackson’s kind and gentle soul are a welcomed addition to any work room. 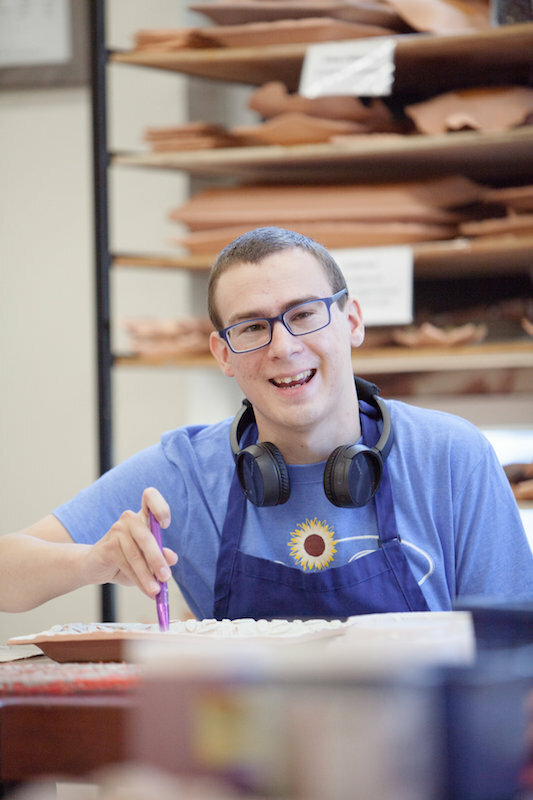 Jackson brings a joyful presence to all workrooms and his excitement for work is infectious. His favorite part of BiG is being creative with all of his friends. When not at work, Jackson loves to go to the movies and play on his PlayStation 2. He loves all things purple and would love to live at Disneyland someday. 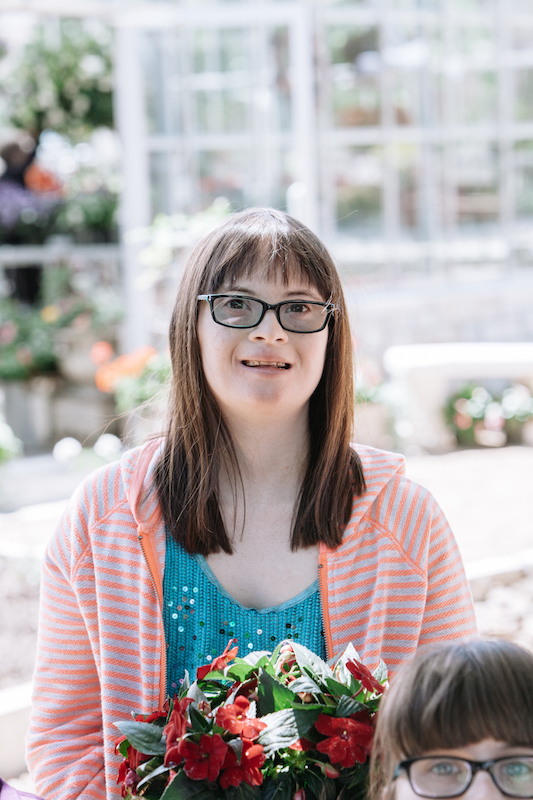 Jana has a quiet and sweet personality that makes all of us smile. She dances through each workroom gracefully completing each task set before her. Although glazing is her favorite, BiG band music and cards would be a close second. When not at work, Jana loves listening to music and spending time with her family. Jason’s favorite thing of all is receiving a paycheck! Creative, kind and hard working, Jenny adds a quiet grace to the workroom. Lucky for BiG, Jenny also brings experience and wisdom from her tenure at the inspirational Brookwood Community in Brookshire, TX. She moved to Georgetown in 2015 and loves to spend time with her mother, bake cookies, exercise and watch TV. 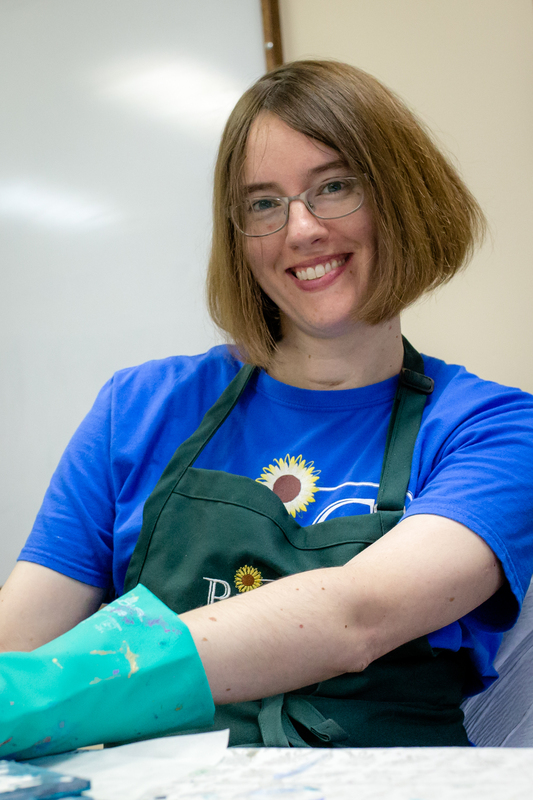 While Jenny’s capable hands touch every enterprise, her absolute favorite is making granola. Jenny would like everyone to know she totally loves her job and dreams of someday starring in a movie. At BiG, Jeremiah is up for any task and always gives his all. 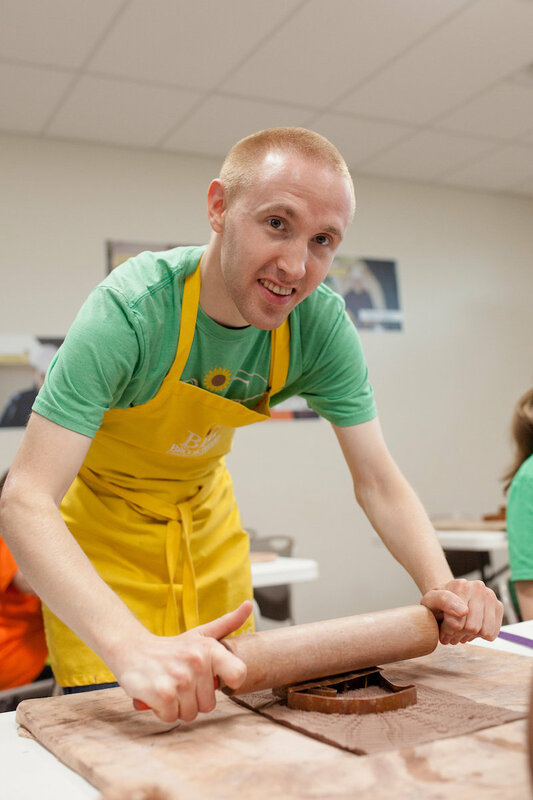 He quickly learns new skills and is an asset in the clay, glazing and card rooms. 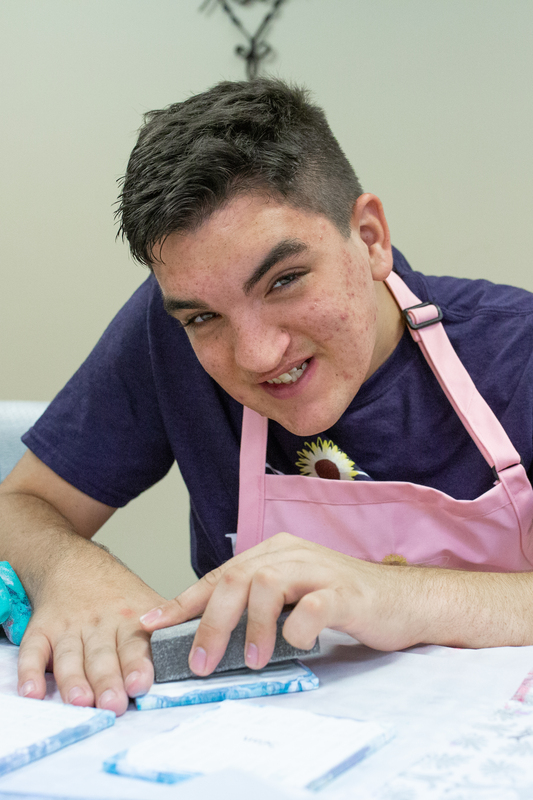 His favorite job at work is imprinting the clay with a pattern using the rolling pin. When not at work, Jeremiah enjoys camping, the band Styx, and hanging out with his brother. 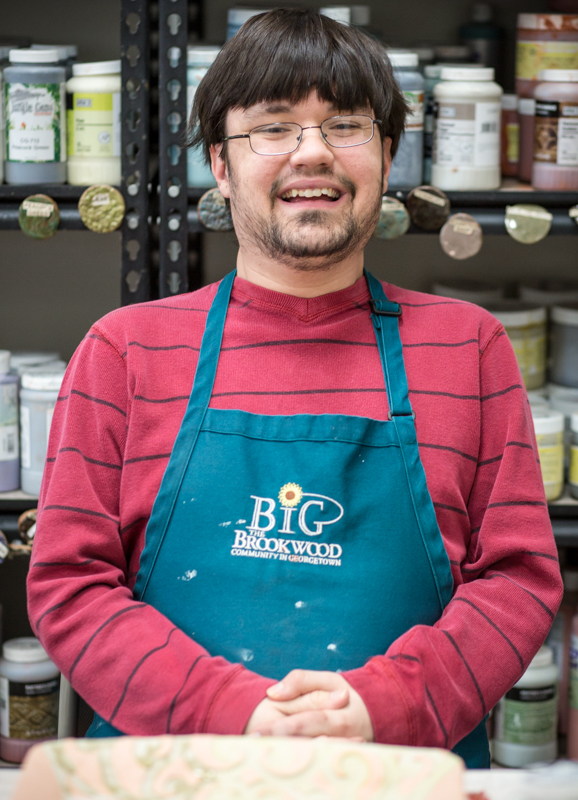 Joel was born and raised in Austin, but his family moved to Georgetown soon after he started working at BiG. Joel loves all his new friends, glazing and working in the slab room. His smile is contagious and he loves to greet people everywhere he goes. When not at BiG, Joel enjoys UT basketball, going to concerts and visiting his Granma in Galveston. He loves spending time with his family and going to church. Kaitie’s favorite part about BiG: her friends. Kaitie has a big personality and an even bigger heart. 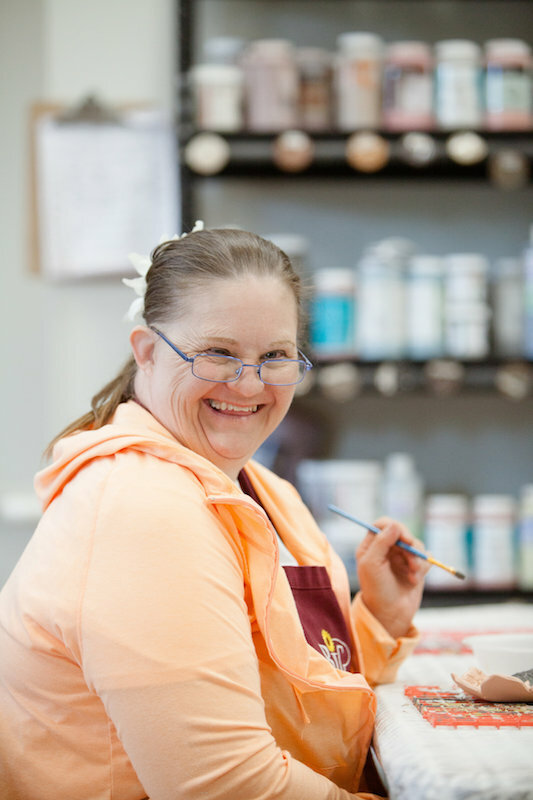 With her confident sense of self and empathetic spirit, Kaitie brings love and laughter to the workroom. Her creativity and positivity are integral to production. When not at work, Kaitie likes hanging out with her parents and sister, listening to Luke Bryan and One Direction, and playing basketball. In 2014, Kelsey moved with her family from Port Aransas to Georgetown in order to attend BiG. 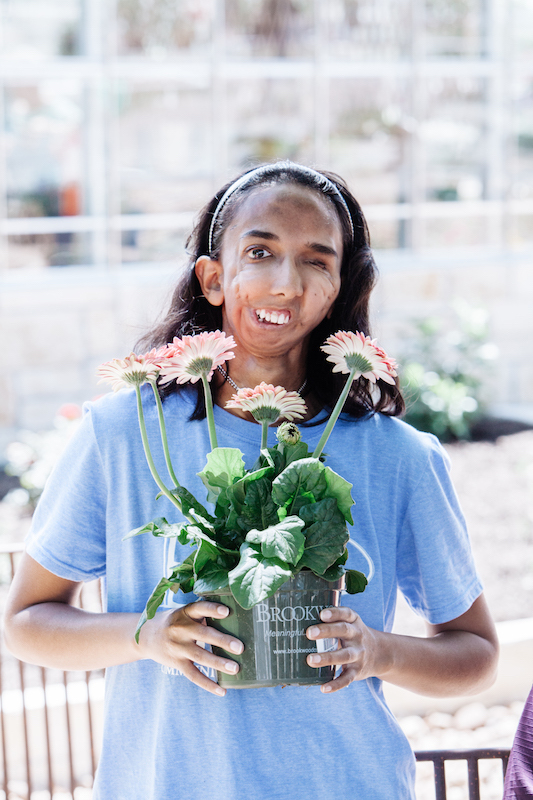 She loves to laugh, sing, and dance, and says that her favorite part of BiG is being with friends. Kelsey loves reading, writing, drawing, and going to the library. She is a true sports fan, and pledges her loyalty to teams who win. One day Kelsey hopes to go to Paris. 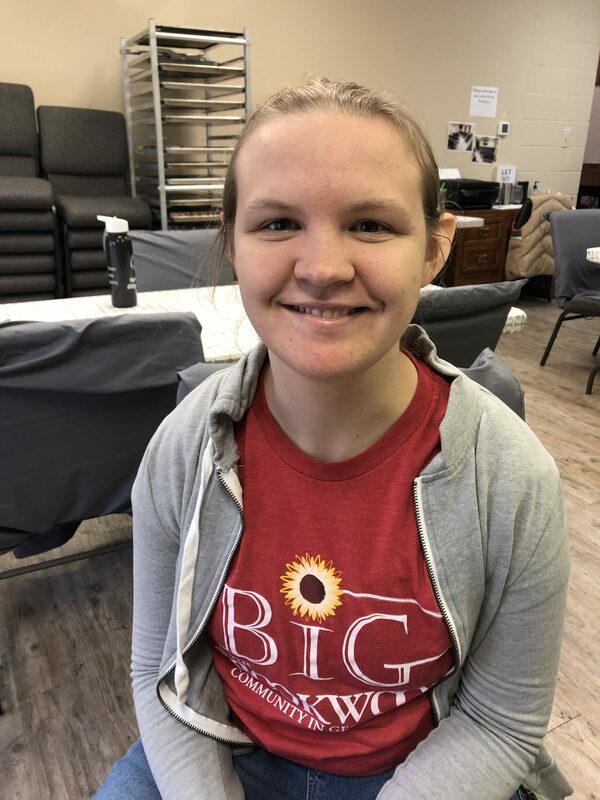 Kinsey has a passion for art and music and loves expressing herself through the creative art initiative at BiG. Kinsey also loves making “thumbs up hands” out of clay and is a master of glue dot placement in our card department. When Kinsey is not at BiG you can find her working at JCPenney, tenderly caring for her ten American Girl Dolls, or playing with her three dogs. BiG has made such a difference in Kylie’s life. She is excited about going to work and has such satisfaction, pride and a feeling of accomplishment in her work at BiG. 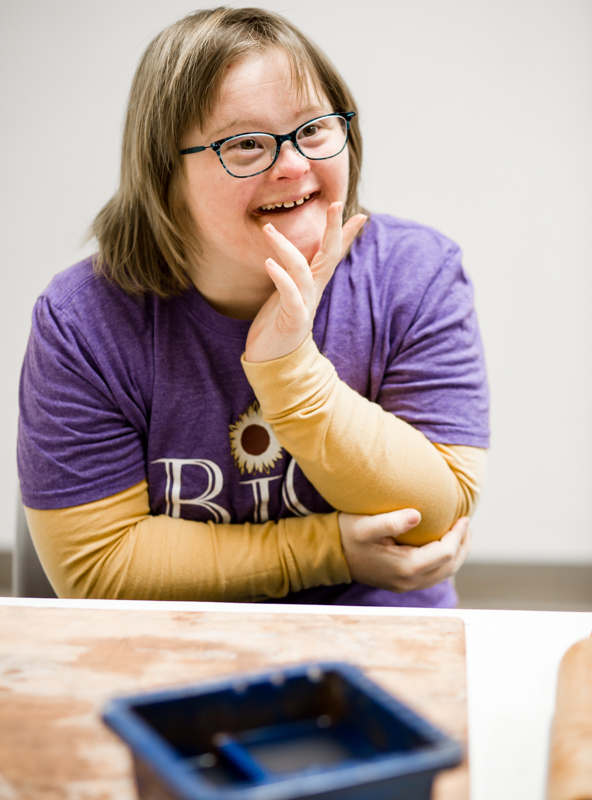 Her favorite things about BiG are “making ceramics, the fun job supervisors and my new friends”. Born in 1971, Marnie moved from Pennsylvania to Austin when she was a baby. loves to dance, watch movies and hang with her family. With an infectious laugh and uplifting spirit, Mary Catherine brings sass and flare to each work session. While she is great in all enterprises, clay is her favorite. However, it is seeing her name on her pink apron that she is most proud of. She is encouraging and friendly to everyone who has the privilege of working beside her. When not at BiG, Mary Catherine enjoys playing with her dog, bowling and painting her nails. She wants everyone to know, that she’s a star! as well as making videos to keep us all laughing. and was one of the original citizens when BiG began in 2011. Rusty loves people and music, and his sense of humor and infectious laughter bring joy to whatever he’s doing. 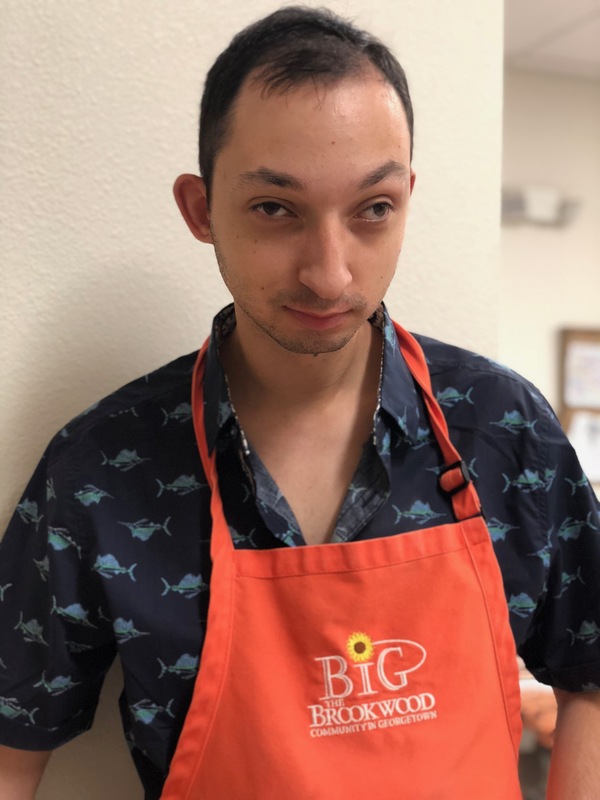 When he’s not working hard at BiG he loves to relax by watching the Price is Right with a cup of sweet tea. Sarah lights up each work room with her positivity and eagerness to work. Her ever present happiness is contagious to all those around her. 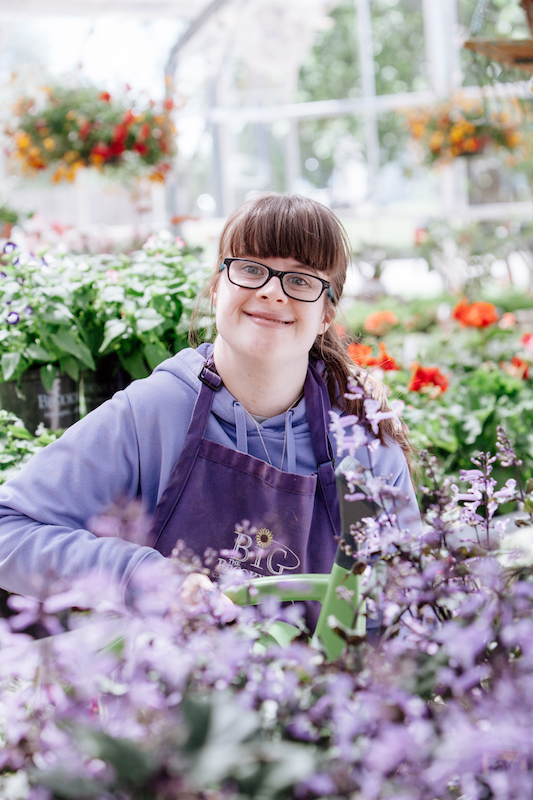 While she enjoys working in every enterprise, working with beautiful flowers in the greenhouse is her absolute favorite. 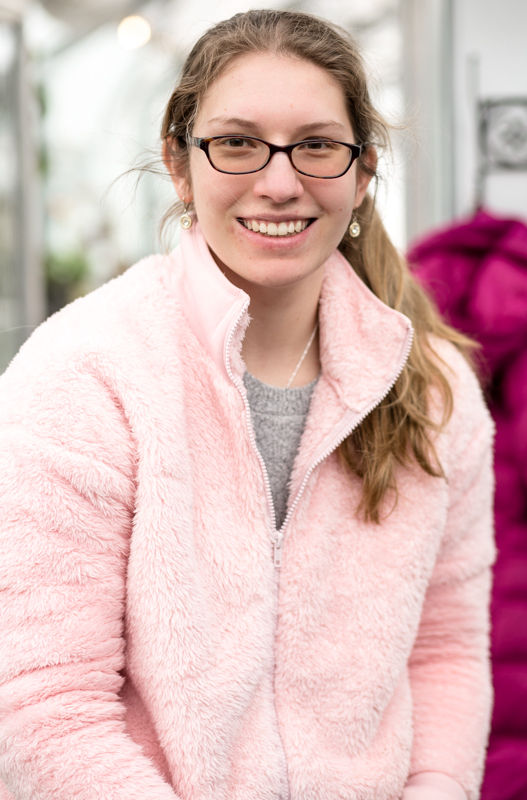 When not at work, Sarah enjoys watching tv, doing puzzles, and going on walks. She loves her family and all her new friends at BiG. 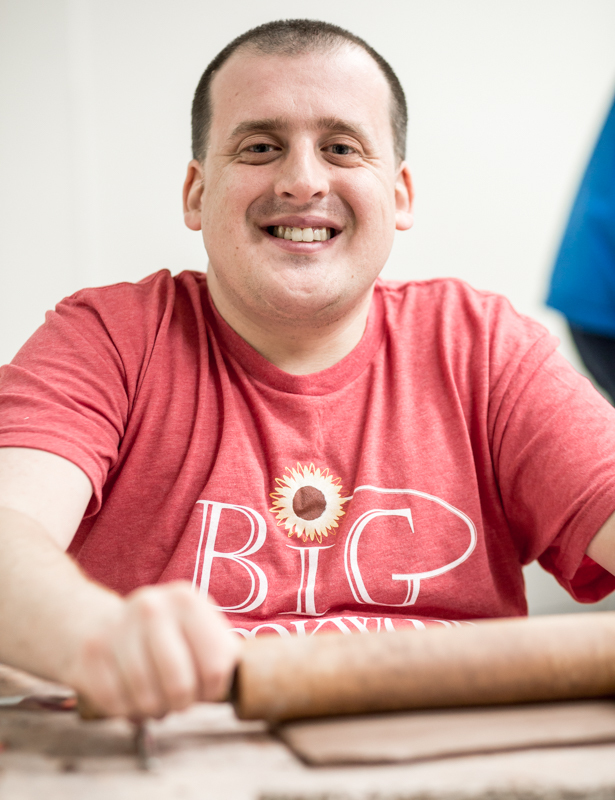 Sean’s favorite enterprise at BiG is pottery and he is one of our expert sunflower cross artisans. He is also BiG’s go-to guy for all of our strongest tasks and is always willing to help. In his free time Sean enjoys swimming, bowling, playing video games and hanging out with his brother. One day Sean would love to travel to China to see panda bears in the wild. 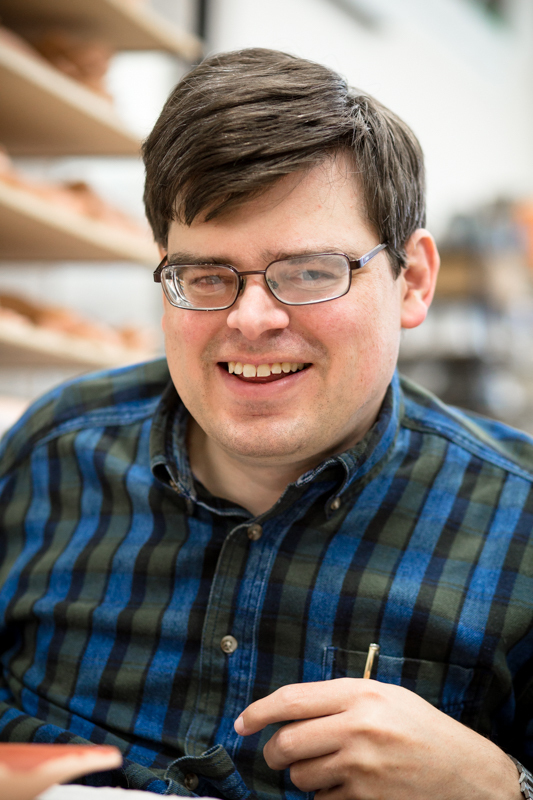 Originally from Waterloo, Iowa, Tim is always willing to lend a hand. With a penchant for organization and great attention to detail, he keeps BiG’s production humming. Tim is passionate about recycling and has started an initiative at BiG. He loves watching movies (especially Herbie movies), going bowling, playing pool, and hanging out with friends and family. Timothy loves dates and numbers and he keeps us on track at BiG. 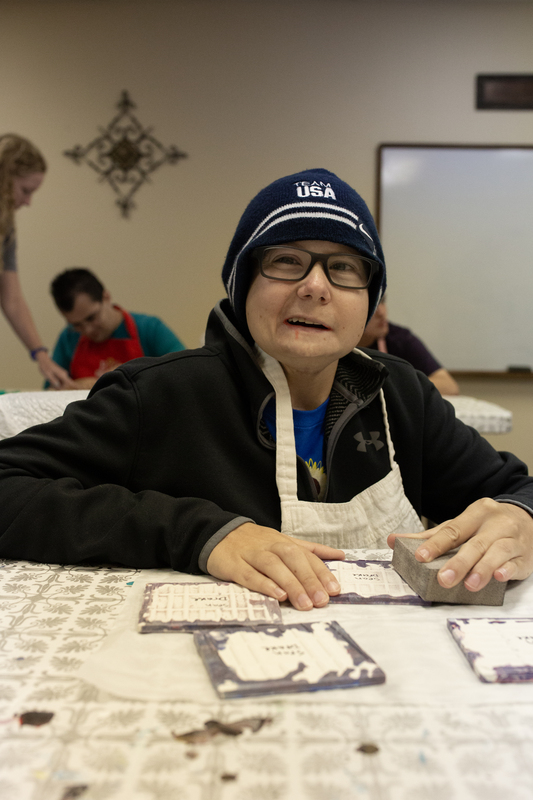 Timothy has great attention to detail and is a wonderful asset to our pottery and card enterprises where his unique lettering and incredible sayings have become legendary. He also enjoys making deliveries in the BiG Truck. 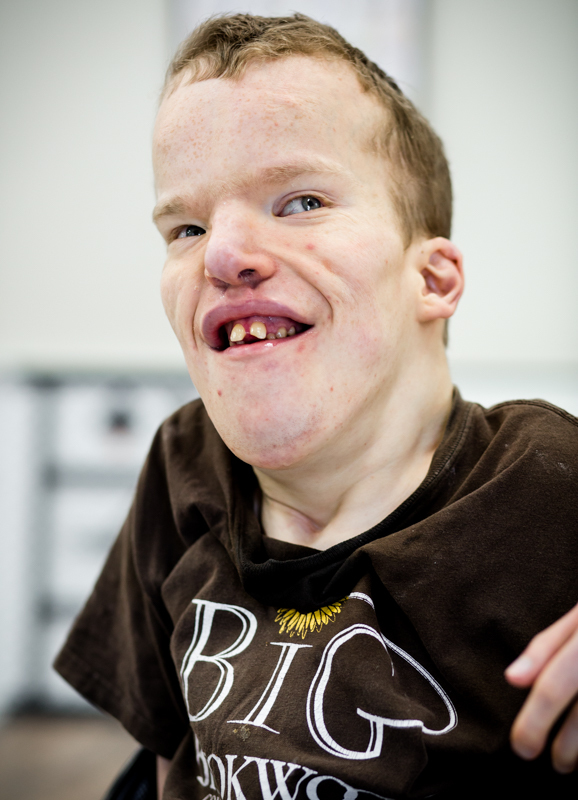 During his free time, Timothy relaxes by watching movies and spending time with his family. A contagiously joyful person be around, Toi moved to Georgetown so she could be a part of BiG. She is a hard worker with a BiG smile! 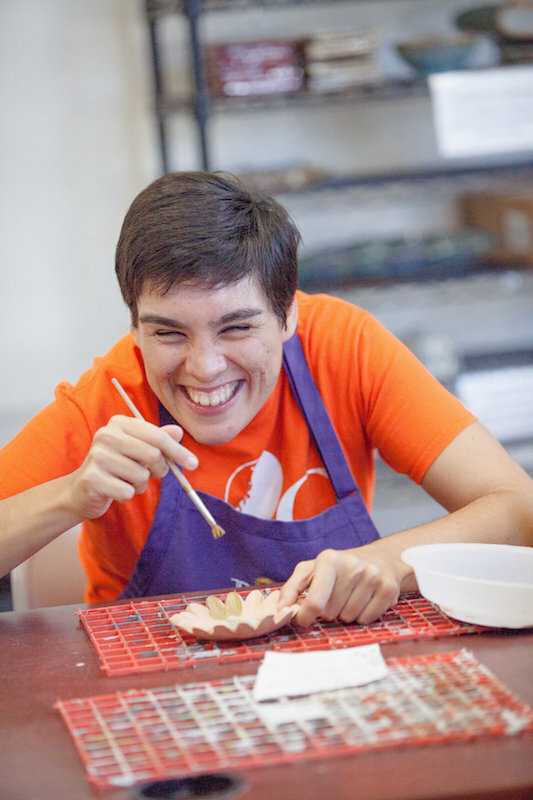 Toi loves working with her friends in all enterprises but Soap and glazing are her absolute favorites! When not at BiG Toi loves to spend time with her family, go bowling or do jigsaw puzzles! Traci is an effective spokesperson for BiG, helping lead tours of the program, travelling to venues to tell her story, and advocating for us wherever she goes. She exemplifies our core value of interdependence and is eager to help out in any way. Traci enjoys training for triathlons (she recently completed the Disney Princess half marathon), playing with her dog, volunteering at her church, and spending time with her family. 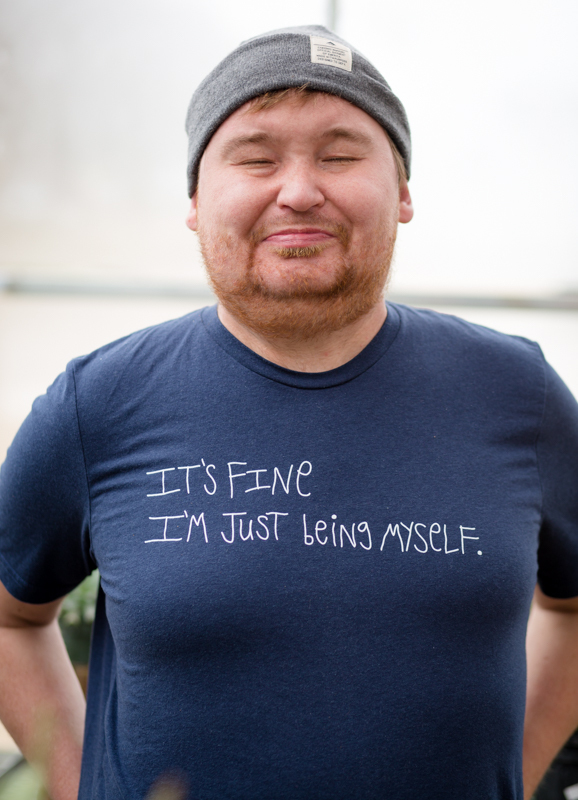 Aidan lives in Georgetown, and his easygoing personality makes him a joy to work with. 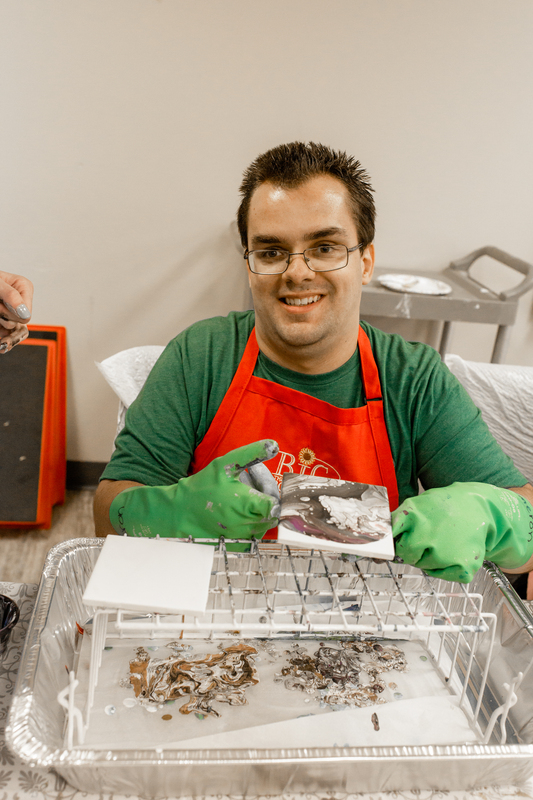 A friendly guy with a good sense of humor, Aidan’s favorite thing to do at BiG is help clean up. When Aidan is not at BiG he enjoys doing puzzles, watching movies, and playing games on his tablet. Originally from Pflugerville, Aubrie moved to Georgetown with her family in 2018. She lights up the room with her joyous spirit and infectious laugh. Her favorite thing to do at BiG is mix ingredients when baking. An animal lover and dancing queen, Aubrie also likes to listen to music and go bowling. Aubrie loves her BiG makeshift family. Cameron is a hard worker who takes tremendous pride in his work. His favorite thing to do at BiG is paint crosses. He is always offering a helping hand to his friends and loves to tour around any visitor that stops by. For fun, Cameron likes to play computer games, eat dinner with his family, and play with his dog, Millie. Drake is a hard worker with a fiery sense of humor. He keeps everyone on their toes with his jokes. His favorite thing to work on at BiG is painting. When Drake is not at BiG he likes to play video games, watch TV, and go bowling. Drake loves working with his friends and creating new things. 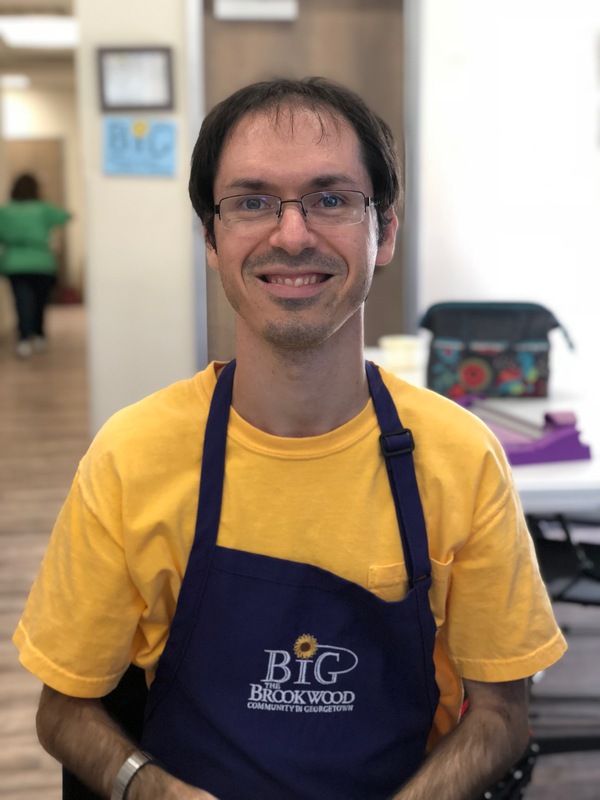 Elek moved to Georgetown from Lubbock in 2018 to become a Citizen at BiG. He loves all of his new friends there and his favorite thing to do is work in the kitchen. Elek’s passion for volunteer firefighters has led him to be appointed to our newly formed safety officer team. 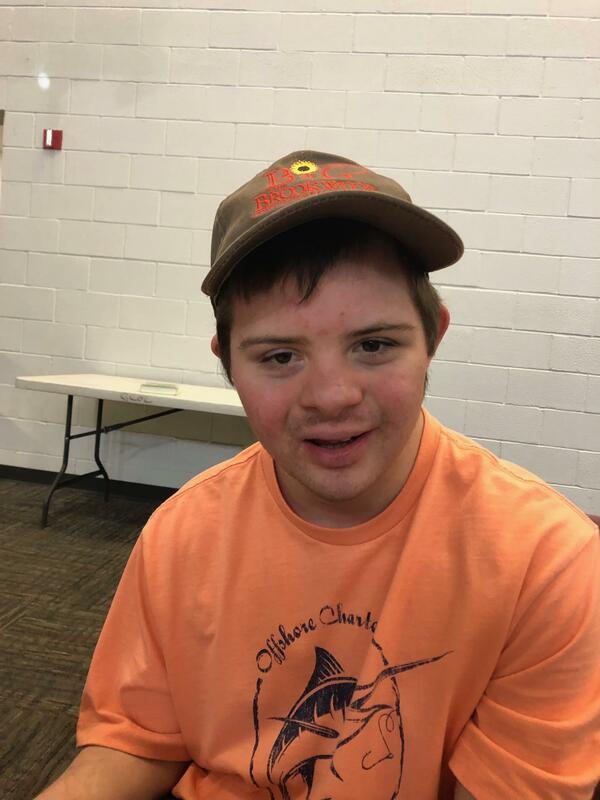 A lover of all things music, Elek especially enjoys George Strait and Jason Aldean, and livens up the work room by singing their tunes while he works. Emily moved to Georgetown from Orange County, CA in 2018. 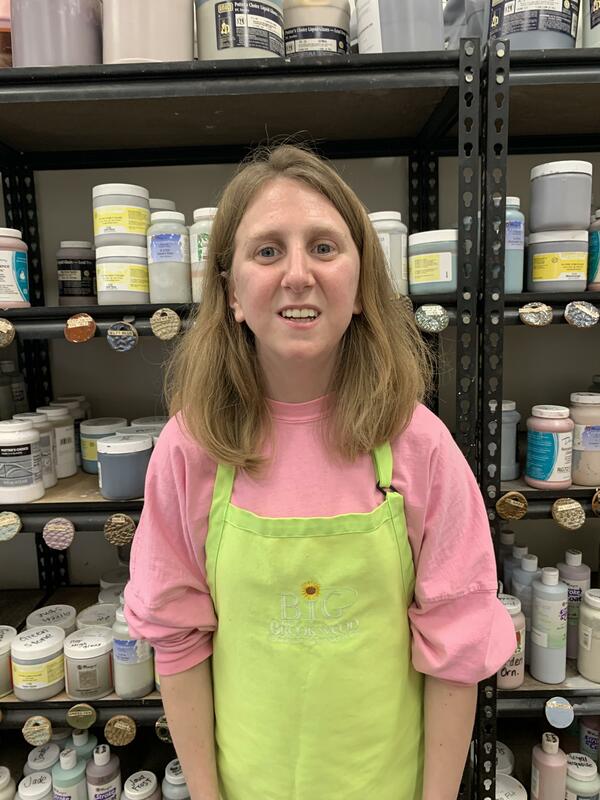 Emily brings joy to the workroom with her contagious laugh and strong work ethic. Outside of work Emily loves getting her nails done, shopping, and watching movies. 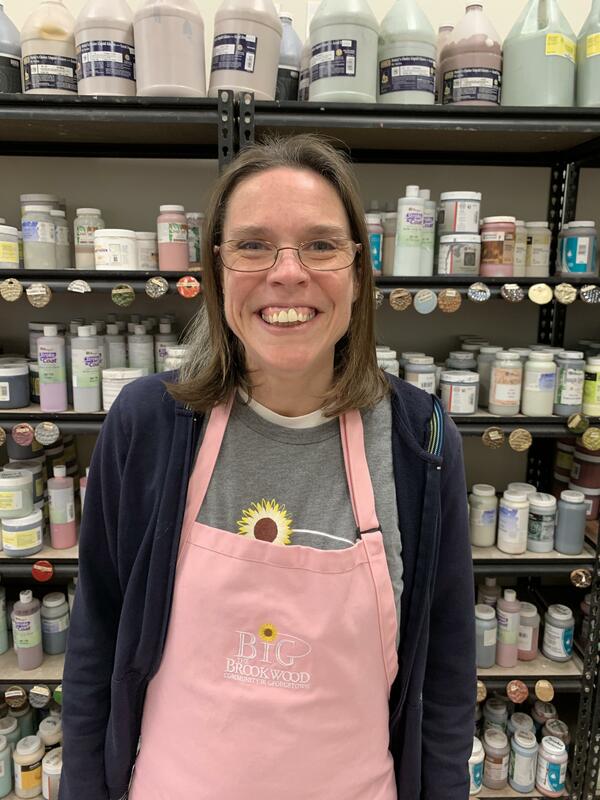 Painting and woodworking are her favorite things to work on at BiG LIGHT Texas and she says she is so happy to be working alongside her friends. Emily is originally from Houston but has called Georgetown home for quite a while now. Emily’s upbeat personality and sense of humor make work extra fun! She enjoys every job she does at BiG, and loves experiencing new things overall. When Emily is not at BiG she likes to hang out with her mom, do word finds, and play board games. Her favorite color is green. 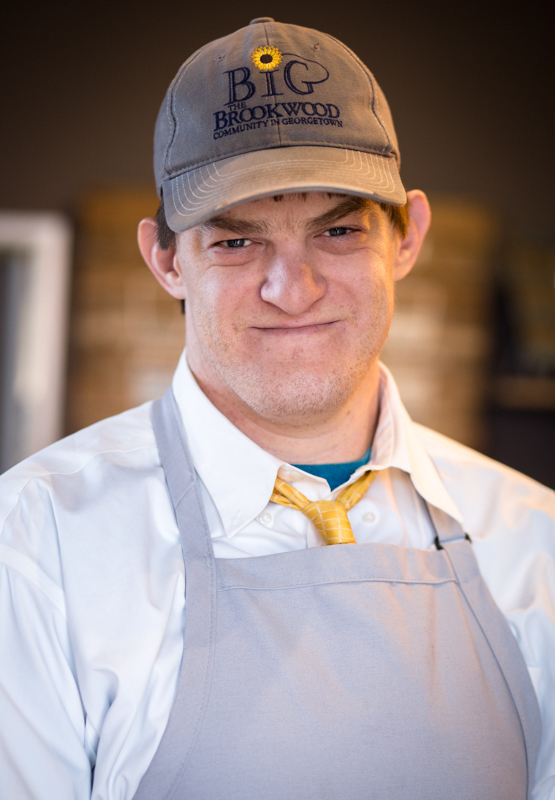 Johnathon’s lively personality and gentle nature make him an essential part of our team. His favorite thing to work on at BiG is painting. When not at BiG Johnathon likes to watch movies, read, and ride his bike. He loves working with his friends. Rachel moved to Burnet from East Texas in 2018 to attend BiG LIGHT Texas. She is enthusiastic about work and dedicated to helping her friends. Her favorite thing to work on at BiG is culinary arts, especially fudge packaging. When Rachel is not at BiG she likes to play with her dog, Booger, do puzzles, and read. She is a trivia buff and loves to challenge her friends with questions. Sean lives in Burnet and has nine brothers and sisters. Sean is a goofball most of the time but serious about his work. His favorite things to do at BiG are working on culinary arts and throwing the football with his friends during break. Sean is very passionate about the sheriff’s department and other first responders, and serves as one of the safety officers at BiG LIGHT Texas. When Sean is not at BiG he likes to swim and hang out with his brother, AJ. 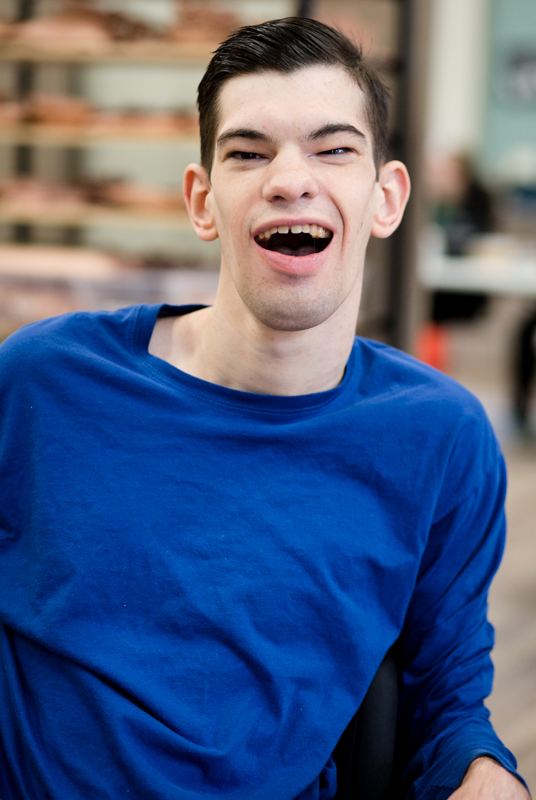 Shawn has a contagious smile and can make anyone laugh with his antics. 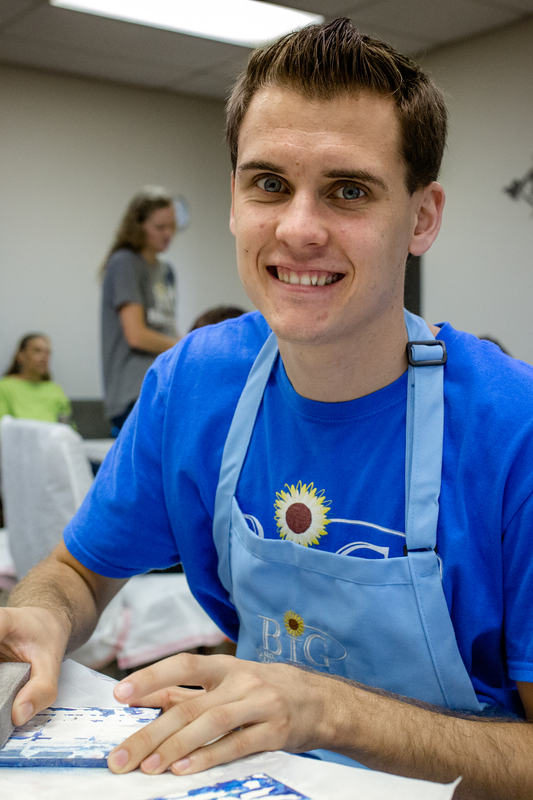 His favorite things to do at BiG are make cookies and package fudge. Shawn enjoys eating lunch with his friends and playing ball at break. For fun he likes to listen to music, look at magazines, and watch movies. An avid lover of 80’s music and steam locomotives, Steven brings a passionate spirit to our workplace. His close attention to detail make him an expert painter and detailed kitchen expediter. When not at BiG, Steven loves to play video games and read about dinosaurs. Tom lives in Round Rock and is a diehard Dallas Cowboys fan. Tom’s favorite thing to do at BiG is help write the dates on ingredients used in the kitchen and play football with his friends during breaks. When he is not at BiG, Tom plays football, competes in Special Olympics, and watches Cowboys games.